Demonstrators occupy the front lawn at the house of Gregory Baer, a top lobbyist for Bank of America. Photo by Andy Kroll. Late Sunday afternoon, the well-heeled residents of Chevy Chase, Maryland, a bucolic suburb northwest of Washington, DC, witnessed a commotion rare for their neighborhood. Toting signs and megaphones, fired up and chanting at the top of their lungs, some 700 demonstrators from around the nation paid a visit to two residents who work as powerful lobbyists for the United States’ biggest banks: Gregory Baer, a deputy counsel for Bank of America, and Peter Scher, a high-ranking executive and lobbyist for JPMorgan Chase. 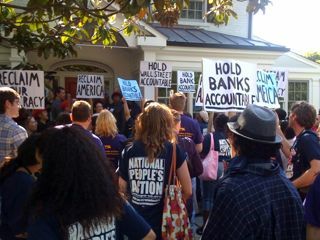 Bussed into Washington by the Service International Employees Union (SEIU) and National People’s Action (NPA), a community organzing network, the protesters visited Baer’s and Scher’s homes as part of a multi-day stand in Washington. On Monday, SEIU and NPA will lead a series of protests on K Street in Washington—a street synonymous with influence and lobbying. The groups are pushing for strong new financial reforms (as teh Senate continues debating legislation to bolster the rules governing Wall Street) and urging banks to stop foreclosures and to promote job creation. Just as the crowd was about to leave around 4:15 pm, Baer, in a baseball cap and shorts, strode up his front lawn and into the crowd. Baer briefly spoke with one of the protest’s organizers, declined to say much at all, then ducked into his house. The crowd hung around Baer’s house for another 25 minutes, their chants drawing curious (and agitated) neighbors onto their porches. Then they left for their second stop of the day. A handful of protesters walked to neighboring houses and handed fliers criticizing Scher and JPMorgan to neighbors watching the scene. On the street, Mark Freeman, a Minneapolis resident and lifelong union member, told of battling Bank of America, which was attempting to foreclose on his modest home in north Minneapolis. “It’s time that we repossess America,” Freeman shouted into the megaphone. As the sun sank lower in the sky, the activists returned to the buses and headed to their hotels. On Monday, their target is a more obvious one: K Street, the Rodeo Drive of Washington lobbying shops, where they will protest Wall Street’s influence-peddlers’ attempts to whittle down financial reform.